MEAN (grrr) value of a function! 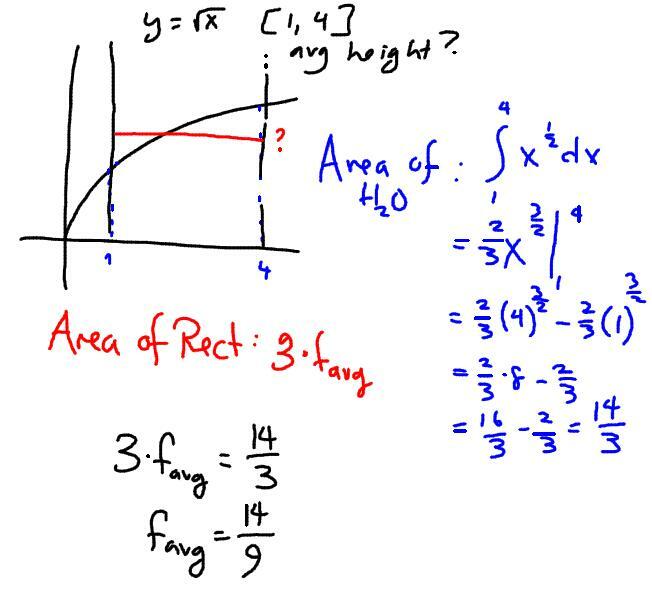 In calculus today I was talking about how to find the average height of a function. Some kids just have a hard time understanding the concept. I always show them a few functions on certain intervals and I ask them what they think the average height would be. Just to initially test their intuition on the concept. Some see it, and understand it; some don’t. All certainly have trouble articulating why they chose that value. So I have two things that work for me, when explaining this. There’s some handwaving, but the focus is on the idea, and building intuition. We take a bunch of temperature readings, and we add them together and divide by the number of readings. How do you make it more accurate? What helps us deal with infinities and infinitessimals? So that’s how we get started. Then when I want them to understand the formula — — I give them a little dumb, cute story. 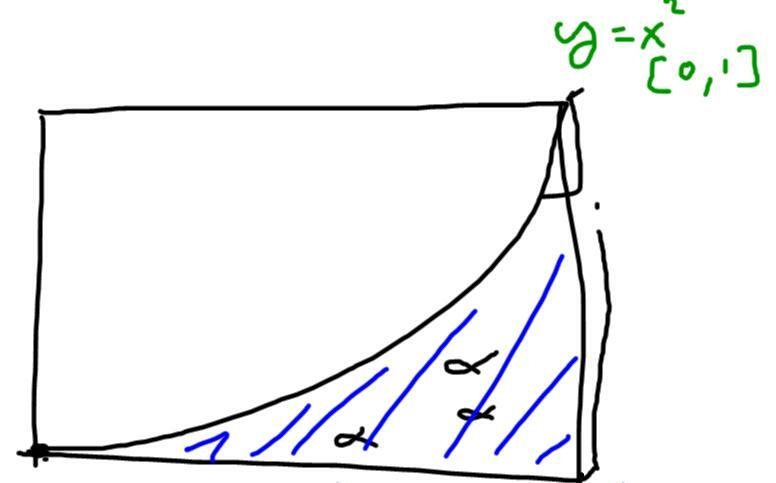 So an EVIL mathematician has an almost 2 dimensional fish tank. Really thin. Sad for the fish. Which are almost 2 D. And the mathematician likes to lay a strip of plastic on top of the water, and constrain the fish in these weird shapes. You come along and want to GIVE THE FISH WHAT THEY WANT: a normal rectangular water to swim in. So you yank the plastic strip away, and what happens to the water? What shape does it make? Does the amount of water change? What’s the height of the rectangle? 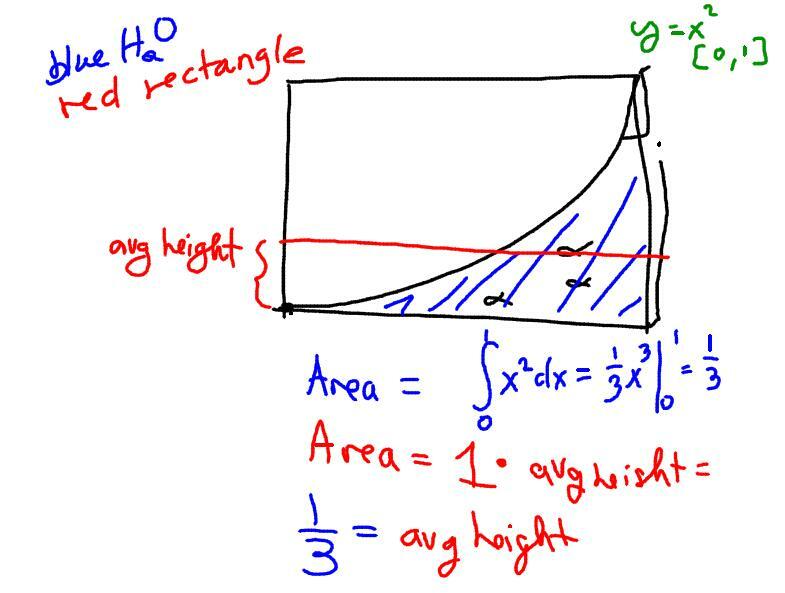 THE AVERAGE HEIGHT OF THE FUNCTION! And since the amount of water didn’t change, they know that the area of the red rectangle and the area of the blue rectangle are the same. That makes sense to them. I then threw this up and almost all of ’em got it! I love the water tank visual. Thanks for the post! I also like the fish tank. I say something similar, but I just use the imagery of building a weird sand-castle and you get a hole on one side and castle on the other, then you can fill it back in. I think the semi-traumatic-PETA-enraging moment with the fish, though, may be an image that sticks with them longer. Oh yeah, and the connection to “Mean” is cute, too. I use something like this to teach averaging to my middle-school kids: Imagine [whatever you’re measuring] as juice in glasses, and then we dump all the glasses into a pitcher and pour them back out so everyone has the same amount to drink. This works very well with bar graphs, because it’s easy to imagine the bars as glasses filled to different levels. And, as with the fish tank, we can easily imagine the liquid seeking its own average level. When did your blog go orange? I think I must be reading it 95% of the time through a reader. Anyhow, I love the swimming alphas – very clear, great probability that a kid will move from “not get it” to “get it” on that model. I don’t like the three-D-ification of the tank – but that’s me.